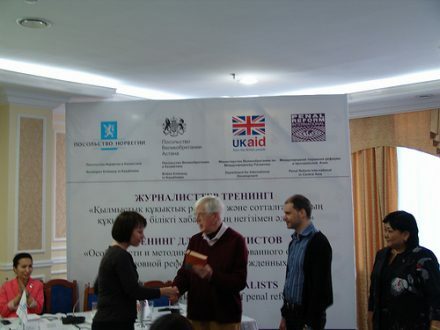 Last month former Guardian journalist Malcolm Dean helped to train 25 journalists in Kazakhstan on current issues in criminal justice reform, the current situation in Kazakhstan’s prisons, strategies for good journalism and successful techniques for bringing criminal justice and human rights to public attention. It came as a shock to learn that only a few years ago 97% of offenders convicted by Kazakhstan’s courts went direct to prison. An even bigger shock was to learn that only one per cent of defendants were found not guilty. This latter statistic remains true today. It therefore was not a surprise to learn that just a decade ago there were only two states in the world with a higher proportion of its people in prison – the US and Russia. I was invited to go to Kazakhstan to take part in yet another PRI initiative: training journalists in the coverage of criminal justice issues. Having just written a book on the malign influence of the media on policy and politics in the UK – which includes a long chapter on law and order – I was eager to take part. I was in for another shock. The fundamental principles of international law with respect to the presumption of innocence and ‘due process’ were being completely ignored by television reporters. Clips from local television news programmes showed reporters arriving at the scene of crimes, thrusting their microphones at suspects and asking them why they had committed the offence before they had even been charged. One psychologically disturbed man, suspected of murdering his mother, was described as ‘a monster’ and interrogated in great details at the scene of the crime that was shown at length. The reporters at the conference were shocked and angry. It turns out the country’s constitution does require the criminal justice system and the media to uphold the basic principles of justice but unfortunately the police, prosecutors and the media ignore these most basic rules. Despite the massive cuts to prison numbers, the Kazakhstan criminal justice system still has some way to go. It currently has 318 prisoners per 100,000 people. International standards raise ‘concern’ about any ratio above 150. Many European countries are below 100. The reduction in numbers was achieved by two means: a succession of amnesties for the convicted; and halving the number of pre-trial detentions, down from 14,000 in 2002 to 6,500 by 2012. As one former senior prison official present noted ‘A soviet mentality still hangs over the system’. With the huge empty interior of its steppes, Kazakhstan was used for a large number of Stalin’s gulags. A large number of the current 75 prisons in the state are former forced labour camps. The UN Special Rapporteur on Torture has also raised concern over continuing torture and abuse of detainees. My message to the journalists was a simple one. Go and look at the alternatives to prison programmes. They provide good interesting stories to report. Across the world they have shown they are more effective than prisons in reducing re-offending and cost much less money to run. This means there are fewer victims and more rehabilitated offenders pursuing productive lives. It is still too early to judge the new probation service, but I urged the journalists to follow what was happening. Its early results show an encouraging reduction in re-offending. I enjoyed the conference. The journalists were passionate about their trade, and are under much more pressure than in the UK. Newspapers and news channels close to opposition parties have been closed. It was a humbling experience. I had to confess there was a lot wrong from where I came from: the 100th anniversary of the English probation service being marred last year by its break up into competitive units and a prison service, which was doing the opposite to Kazakhstan, doubling its population to 85,000 in the last two decades. But at least we still have a free press, though much in need of better regulation. A paperback edition of Malcolm Dean’s book, ‘Democracy under Attack – how the media distort policy and politics’ is being published by Policy Press on April 18, price £9.99.